All animals adopted through WGSR are spayed/neutered, up-to-date on shots, and microchipped. All dogs are hands-on evaluated. We are a foster-based rescue and all dogs live in private homes prior to adoption. We do adopt outside of the State of Arizona. If you are willing to travel to Arizona to meet a dog, and a local rescue is available and able to do a home visit on our behalf, out-of-state adoptions to neighboring states are possible. We DO NOT transport (via air or ground) our dogs to their new homes. 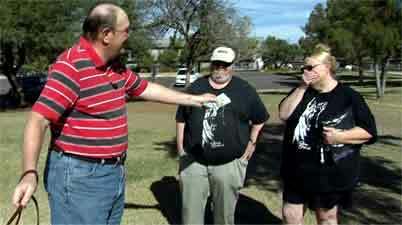 The adopters are responsible for coming to Phoenix and taking the dog home with them. These are all purebred German Shepherd Dogs...why do they all look so different? Because they are! There is a tremendous degree of variation within this breed, which is why we go to such lengths to ensure that the dog in which you are interested is, indeed, the right dog for you, your household and your current lifestyle. GSDs vary in structure, type and temperament, contingent upon the lines from which they were bred, coupled with their level of training and socialization. While you may prefer a certain "look," take care to make temperament, drive levels and the dog's history, the most important factors in choosing the right companion...we do. Partnered with Southwest German Shepherd Rescue (an Arizona 501c3 tax exempt corporation) and a participating member rescue of CABRA (Coalition of All Breed Rescue of Arizona, also a 501c3 organization), we are a small group of individuals dedicated to rescuing, rehabilitating and rehoming white German Shepherd Dogs into their forever homes. First and foremost, we are all about the DOG. 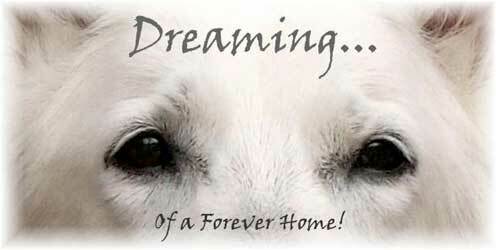 We do not place a dog in a home just because we need to make space for a new rescue. We put the dog's best interest at heart at all times and will not place a dog in a home that is not suitable. Adoption fees vary with each dog and typically range from $150.00 to $450.00. 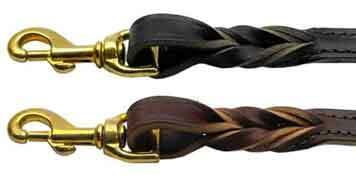 They are set, taking into account the dog's age, training level, medical condition(s) (if any) and other factors. Some dogs require that hundreds of dollars and many weeks, even months, be spent before they are ready for adoption; others do not. Adoption fees are used, not only to rescue and place the dog you are personally adopting, but to aid in the future rescue and rehabilitation of other deserving dogs. Adoption fees are necessary; without fees our rescue efforts would quickly come to an end. Our greatest expenses include the cost of gas, microchips, vet visits & surgery, blood work and lab fees, medications, vaccinations, dog food, collars, leashes, crates & toys, websites, domain names and ISPs, and sometimes we even have to pay adoption fees to rescue a dog. Office expenses add up as well. Rescue is an expensive undertaking, both financially and emotionally, and is motivated solely by our passion for German Shepherd Dogs. We are volunteers. We volunteer our time (countless hours every day), and we are by no means wealthy. We do not make a profit and seldom break even. Adoption fees come in and go right back out to the next rescued dog. Nancy: WhiteGSDRescue@aol.com. Before emailing us to inquire about adopting a dog, please visit the AVAILABLE DOGS PAGE on our shared website with Southwest GSD Rescue and fill out a Prospective Adopter's Questionnaire, found on any of the white GSDs bio pages. Once a questionnaire is submitted, you will be contacted (usually within 24 hours) to set up an introduction with the dog(s) that you are interested in if they are a suitable match for you and your family. CLICK TO SIGN UP & START HELPING TODAY!!! YOUR ONLINE SHOPPING CAN HELP OUR CAUSE. It doesn't cost you anything or change the way you shop, but a percentage of each and every purchase will be donated to White German Shepherd Rescue once you join. Won't you help us? 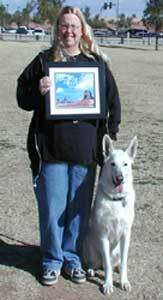 Want to know More about White German Shepherds? Dr. Sarah Wooten has recently written a free online guide to encourage potential pet owners to adopt shelter dogs. She named this eBook Adopting a Shelter Dog, The Official Guidebook. In this free guide, she offers professional advice on things like selecting a shelter dog, preparing your home, making them feel welcome and so on. If you click on the link, you can check it out. This free book guides you through the first seven days of Adopting a Rescue Dog. With seven simple lessons, the book helps you ease the transition from shelter life to home life for you and your pup. You can download your copy here. No fee is charged to a surrendering owner; however, a donation along with a surrendered dog is VERY much appreciated in helping to defray the costs of finding & placing your dog in its forever home. All owners are required to sign an Owner Surrender form prior to placement. WE RESPECT AND PROTECT SENIOR CANINES. 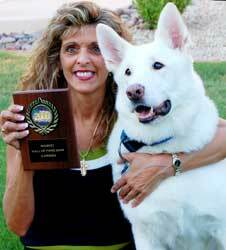 We are extremely proud to announce that our very own "Carson," rescued by White German Shepherd Rescue in 2004, was inducted into the White German Shepherd Dog Club International's HALL OF FAME for his bravery in saving the life of his family. A GREAT GIFT, A GREAT CAUSE, A GREAT GESTURE! Thanks for spreading the word about RESCUE!! Please Email Nancy at WhiteGSDRescue@AOL.com with any questions regarding the below sale items. DUE TO HIGH DEMAND FOR OUR DECAL, WE ARE NOW MAKING A VERY LIMITED NUMBER AVAILABLE TO YOU. 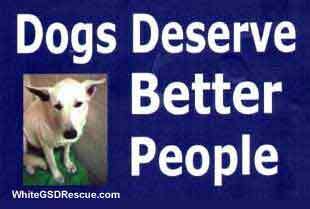 "DOGS DESERVE BETTER PEOPLE" IS A 4" x 6" VINYL DECAL WITH SID'S PRE-RESCUE PHOTO. Cost is $25 for sizes small to 4XL, plus $5.00 mailing. 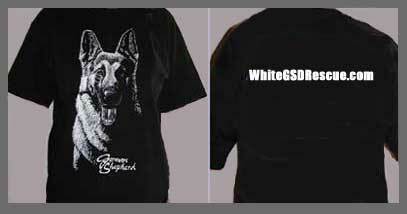 To get yours, choose your size, then click on the BUY IT NOW button below to purchase via PayPal or mail your check to White GSD Rescue, 2807 W Michelle Drive, Phoenix, AZ 85053: If you would like to pick up your shirt to save the $5.00 mailing fee, please Email Nancy at WhiteGSDRescue@AOL.com to set up a time and place. And no one stopped to give a pat, or to gently say my name. And rest assured that when you sleep, your dreams will all be sweet." She told me 'bout the rescue group and what it meant to her. And in the center there is you protected by new friends." "And all the other folk are searching near and far. and pretty soon we'll find them, just you wait and see." visitor to our site since December 18, 2017. Welcome! !